What can I say? Xylish amuses me to no end. They are the cutest yet rather miss the mark snack foods so far from their stylin wrapping to the cute Box-in-a-box Space Not Really Saving packaging. I love these fallas! I want to take them home and introduce them to my ma. Plus, they are rather tasty. The Clear Green Xylish is in fact not clear but it is green (and, obviously, Xylish). I’m not sure what the whole clear thing is about, maybe it’s clearly green, which it definitely is, or maybe clear is they type of green, like kelly or olive, or maybe clear is what the name will never be because it was Engrished. Whatever, they are green. Moving on. These were much more like Chicklits than the other Xylish, which gained lots of points with me. I love a good crisp candy coating on a gum ball (or gum square in this case. Either or, crispy is good in my book) and these Xylish were mighty fine with the candy coating. Except it’s not candy because Xylish is sugarless, so rather they had a very good not-candy candy-like coating that crunched most pleasingly. Plus, they were a very nice green and did you see the cute packaging? Awwww! After the crunchy comes the minty. Clear Green isn’t as MINTY! as the Crystal Mint sort of the same way wintergreen isn’t as minty as peppermint. Both are mint but clearly peppermint is the king of mints while wintergreen is sort of the duke or earl. I’m not dissin’ the wintergreen, it happens to be my favorite of the mint monarchy, but it;s a softer more relaxed mint than peppermint. 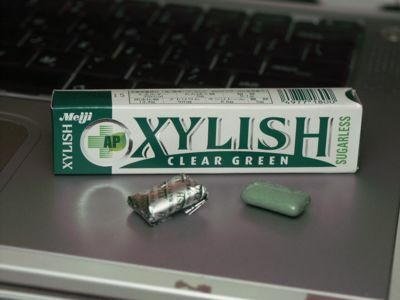 And so too, Clear green Xylish is a softer more gentle mint than the Crystal mint. Is it wintergreen? I don’t think so. Is it peppermint? Not exactly. Perhaps it’s a mint blend. Or would that be “clearly, it’s a mint blend”? Clear Green isn’t as mentholated minty as Crystal Mint either which is both good and bad. The good is that the strange sugar substitute that was present in the Crystal Mint is very subdued in Clear Green, if it is present at all. Is the chemical sugar substitute related to the mintholated? I have no idea, but I do know the one with the stronger chemical taste is also the one with the mintholated going on in spades. On the whole, I prefer the less mintholated with less chemical. The bad is that the mintholation was sort of what kept the flavor rockin’ your mouth. Clear Green loses its flavor much earlier than the Crystal Mint so after 15 minutes I was definitely chewing on a tasteless wad o’ gum with a faint hint of mintholation lingering in my mouth. Mint taste linger = good! Wad o’ tasteless gum = bad. However, it’s a nicely soft wad of gum with a more pleasant chewing texture so if wad o’ gum is your thing, this is good chewing for quite some time. Perhaps one clearly needs to chew up to the 15 minute mark, discard the gum and enjoy the after mint.